Critical Point: Incursion is a standalone game created with Epic Games' Unreal Development Kit. Incursion is a semi-realistic, arcade-like first-person shooter combining tactical gameplay with arcade-style speed.Utilising a wide variety of modern weaponry and set in fantastically rendered locations, the Mercenaries and Special Forces meet at a critical point! In a rush-based mode as seen in first-person shooters such as CoD4, Battlefield 3, Counter Strike and TO:AoT, teams are given level-specific objectives in round-based scenarios! CP:I is aimed at a large player base, offering a huge platform for competitive clan and league play, allowing individuals to shine and capture their glory regardless of how many hours they have played. It accentuates skill vs luck, aiming vs spraying, etc. We differ from the competition by having no unlockables, no RPG's, claymores, tanks, jets or other vehicles. Just PURE infantry combat action!! ... maybe it's just because it's so smooth or something I don't know. If you compare the two you'll know what I mean. The draw animations are okay. The idle animations are fantastic. The firing animations are really bad. Recoil doesn't just go perfectly upwards like the weapon is on a hinge. It goes backwards, into the holder's shoulder and thus the gun moves in many directions. The animation now looks really too unrealistic and cheesy, like something from an N64 game. Plus the reload animation is wrong, unless you emptied the mag in that demo because that's the only time you have to do the whole 1 (remove mag) 2 (insert mag) 3 (chamber the 1st round) otherwise it's just 1 2. You only need to Chamber the first round if you emptied the mag. You do realize that when in combat, you really don't count bullets that well, so chambering a round "just to be sure" is viable. That is not entirely accurate. We are trained to count every round and to leave one in the chamber so that we are able to fire if we need to while reloading. You never drain your weapon. I would have to agree with what a few others have said. The recoil animation looks very off. The recoil, as has been stated multiple times, is just wrong. An AK47 held properly (in the small of your shoulder) would kick back a lot more than up. It only rotates up about 5-8 degrees; the rest of the energy is transferred into your shoulder and your torso. As Daishi2442 stated, the recoil should be revised to push back. This one looks uncomfortable and does not stay in the same line as the "imaginary" crosshair....kinda gives the illusion you are missing your shots. Nonetheless, it still looks good. I would assume it still needs more polishing. The animations seem very robotic, especially the fire animations. needs more variables, some horizontal recoil as well as vertical. 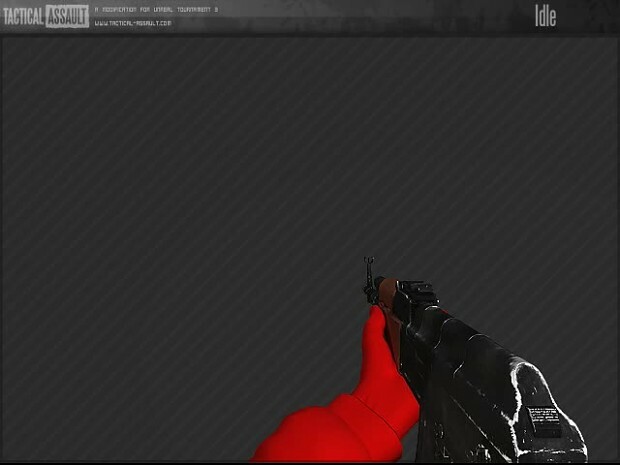 What FPS would be complete without a little AK action?